• For quantitative determination of alanine transaminase activity. • Alanine Transaminase (ALT), also known as serum alanine aminotransferase (ALAT) or pyruvic transaminase (SGPT), facilitates the conversion of alanine and a-ketoglutarate to pyruvate and glutamate. ALT plays an important role in gluconeogenesis and amino acid metabolism. ALT is found mainly in the liver, and, to a lesser extent, in kidney, heart, muscle, and pancreas tissues. Normal serum levels of ALT are low, and increased serum ALT activity is widely used as a marker for liver damage. Simple, direct and automation-ready procedures for measuring ALT activity find wide applications in research and drug discovery. BioAssay Systems ALT activity assay is based on the quantification of pyruvate produced by ALT. In this assay, pyruvate and NADH are converted to lactate and NAD by the enzyme lactate dehydrogenase (LDH). 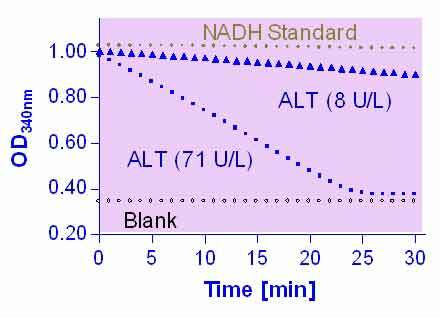 The decrease in NADH absorbance at 340 nm is proportional to ALT activity. 1. In regards to the ALT Assay Kit (EALT-100), do you guys sell a positive control? We do not sell a positive control for this assay. Purified ALT is available from companies such as Sigma. Alternatively, serum samples could be used, for instance FBS (not heat inactivated).